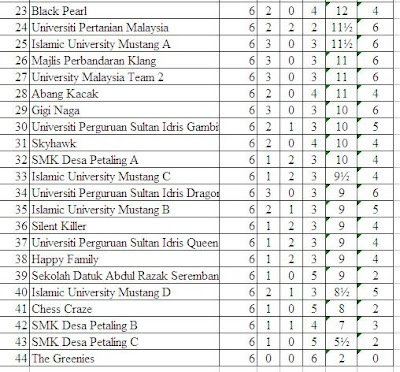 Today 44 teams had participated in the Tan Sri Zahiruddin (TSZ) of University Malaya (UM) chess tournament. 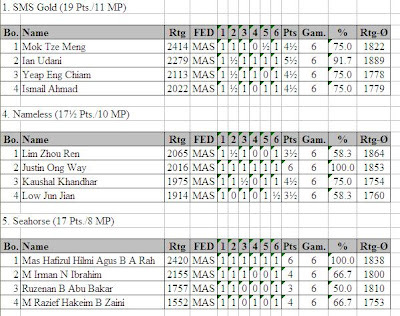 Below are the results as per emailed by Najib Wahab. 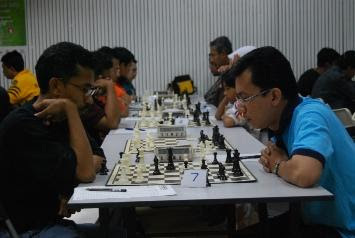 The tournament is a bit unique because not many team chess tournaments organized in Malaysia. The format is rapid six Swiss rounds. GiLoCatur's children did not participate in the event. Anis had a school program during the weekend. Fikri will have an exam next week and had last minute "balik wajib". 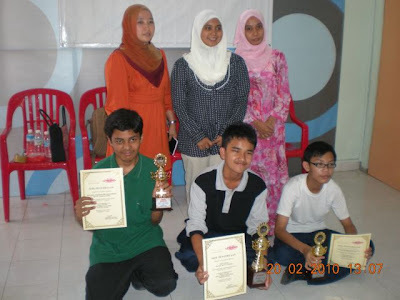 They both participated in this event in 2008 which was held in March along with two other their SKBJ (Sekolah Kebangsaan Bukit Jelutong) chess friends, Nur Faqihah and Aminur Nirza. Their team was known as "SKBJ Marvellous Knights" and was among 21 teams participated. GiLoCatur wrote about this in the old version of SKBJ Chess Club blog at googlepages as per here. Do you notice who had the perfect 6 points score in the above picture? Two players actually - Justin Ong of Nameless on board 2 and IM Mas Hafizulhelmi of Seahorse on board 1. In fact, there is another player who had the perfect 6 wins. He is Faiezul Zainal of N9 Warriors who played on board 2. His team was fourth placed. Andrew Ooi of Gilachess and Shamsuddin Sabri of fireyrook were also participated in the event. 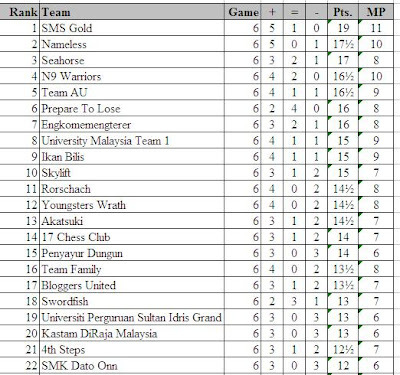 With two other blogger friends, they teamead as "Bloggers United" and was 17th placed with 13.5 points and 7 match points. 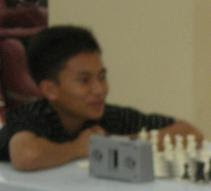 GiLoCatur could not follow very closely the first Malaysian Women Masters held during this weekend starting on Friday. It is because GiLoCatur was busy with work and own routines. Tonight, after everything is settle, GiLoCatur has the free time to check on the updates of the Masters that can be the first milestone for the growth and development of chess for the ladies and girls. Lots of controversies, comments and feedbacks regarding the selection of the sixteen players for the Masters. GiLoCatur does not want to comment much on that. What's important is such tournament to identify and find the best women players for Malaysia MUST be held every year to make sure that Malaysia is not lacking in women chess players. Based on GiLoCatur's observation since being in the chess fraternity a couple of years ago, not many women are interested in playing chess. Many talented girl players leave the chess scene after completing their high school, get married and work. What are the reasons? Why? What are the root causes they do not want to play chess anymore? GiLoCatur urges and hopes that the Malaysian chess fraternity to come up with a workshop or seminar with working paper to discuss about this matter. Who else is going to do that? The current women players also need to fight and do something to make sure that their younger sisters can have bright future and good opportunity in chess. We do not have many chess tournaments specifically for women or girls except the age groups. Or maybe a ladies category in a chess tournament. In USA, Susan Polgar is doing this. The prize for Best Lady category is not good enough to attract the lady players. There should be a reward when a lady or a girl player when she beats her higher rated opponent. Parents should encourage their daughters to play chess and keep playing chess like Cikgu Zull does to WCM Shazwani eventhough she is really busy with her medical studies, just to name one example. Parents need to be very supportive for their daughters to play chess like Cikgu Sabirin from Terengganu with his daughters - Aishah and Khadijah, just to name one example. A lady chess icon is needed for the girls as a motivation like maybe the Polgar sisters, Alexandra Kosteniuk, Hou Yi Fan or Irene Sukandar of Indonesia. 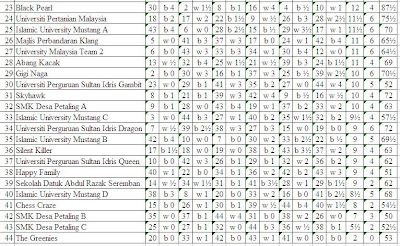 For the Malaysian girls especially, check out the Malaysian Women Masters updates at NWM Khairunnisa's blog here or Hairul's blog here for some annotated games. 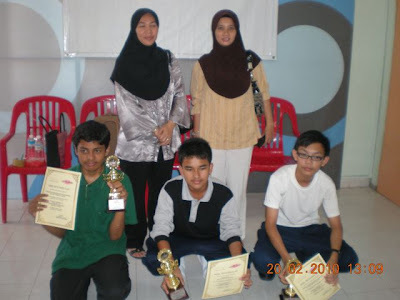 Yesterday, "DATCC Rookie Tornado" was another chess tournament held in Malaysia. The tournament is just for Under 1400 national ratings or unrated chess players. The format of the tournament is rapid G/25 seven-round SWISS system. 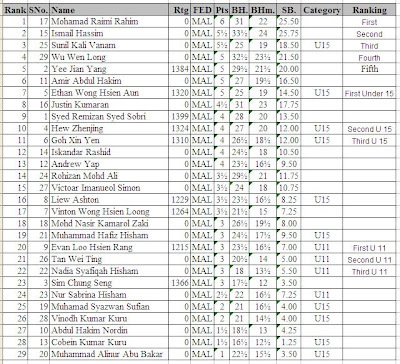 Below is the final ranking as per emailed by Encik Najib Wahab. "Tahniah" and "syabas" to all the winners! A Cendol Restaurant In Seremban? While driving around in Seremban yesterday, one restaurant caught GiLoCatur's eyes and attention. The restaurant is painted in Green. 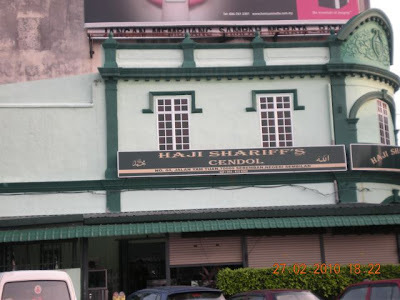 Haji Shariff's Cendol is the name of the restaurant. GiLoCatur had never noticed about it before. So, quickly after the tournament finished GiLoCatur and family rushed to the restaurant. Unfortunately, it was just closed. It is open daily until 6.30pm. What a miss! Never mind, next time whenever GiLoCatur in Seremban sure will have cendol in the restaurant. Or by the way, what is "cendol"? For the Malaysians, they know what cendol is. How about others? Below is the description of Cendol extracted from wikipedia and www.penang-traveltips.com. Cendol is a sweet dessert broth that is found throughout Malaysia and Indoneisa, as well as South Thailand and Singapore. The Teochew and Nyonya people have also adopted it and created their own version. In Malaysia, cendol is particularly popular in Penang and Malacca. The Teochew cendol is the most popular in Penang, and of all the cendol stalls in Penang, the most famous are the two Teochew cendol stalls on either side of Lebuh Keng Kwee off Penang Road. The namesake cendol are short starch noodles traditionally colored with pandan leaves. Nowadays artificial coloring is used. Other ingredients of the Teochew cendol of Penang include coconut milk, palm sugar (gula melaka), red beans and grated ice. In other parts of Malaysia, glutinous rice is also added. GiLoCatur was too tired last night and fell asleep during the halftime of Chelsea vs Manchester City match after being out to the Seremban Parade Chess Agegroup from 7.30am until 8.30pm. Therefore, no blogging activity last night. Today after going to Section 6 wet market and having "branch", GiLoCatur has lots of blog updates to do. First, GiLoCatur wants to share the results of the Seremban Parade Chess Open. Actually, the tournament is divided into two on two days - yesterday and today. Yesterday is for age group competition - Under 18 and Under 12 categories. Today, the Open category is on-going. Hopefully, GiLoCatur can get the results to publish in the blog. At first, GiLoCatur did not plan to go since Anis has a camp organized by her school to attend, and it wasn't a scheduled outing for Fikri. But somehow Fikri called on thursday night asking to pick him up from the hostel since his school decided this weekend is an outing. So, GiLoCatur decided to bring the boys to the tourney to keep up their chess momentum. By the way, Fahim needs more and more exposure for his debut in the coming NAG in penang. As for Fikri, GiLoCatur does not expect too much from him since he already had a sparring session and moreover needs to study for his exams next week. We arrived at around 9.00 am at the venue of the tournament. Since the shopping complex is not open yet until 10.00am, we went out and drove around Seremban town. Fahim had his photographing session near the Wisma Negeri. When reached back at the tournament venue, many participants and their accompanying parents were already there. The tournament for the age group categories attracted more participants than the organizer had expected and targeted. It is a good sign for chess in Seremban particularly and Negeri Sembilan (N9) generally. PCNS, the acronym for N9 Chess Assoaciation or its Malay "Persatuan Catur Negeri Sembilan" needs to take this opportunity to develop and promote chess. Surely, it does not have the privilege like what CAS and KLCA have where parents are very supportive and already developed their chess children. Click at the picture for larger view. In Under 18, there was a total of 48 players participated. Few of them are from outside Seremban like Syakir and his younger brother Irfan from Kuala Selangor, Fikri from Shah Alam, Fairuz Hamizah from Kedah and Kok Wei Tze, the player who beat Abg Bro at MMU Open recently, from Melaka. Syakir from Sekolah Sains Kuala Selangor - the champion for U18 category who won all his six rounds including Fairuz Hamizah, one of the Women Masters participants, and Fikri Saleh of Shah Alam. In the Under 12 category, 51 players participated including several of them from outside Seremban like the Puteri sisters - Rifqah and Munajjah from Jenjarom Kuala Langat, Fahim from Bukit Jelutong Shah Alam, Noor Azam and his younger sister, Maisarah, from Rawang and Sirajuddin from Kedah. Sirajuddin Munawir from Kedah had emerged champion for Under 12 age group by scoring the perfect six points from six rounds. The pictures of the tourney can be accessed at GiLoCatur Fan Club facebook here. You need to be members to view them. Setelah GiLoCatur miss sparring session pada minggu lepas, malam ini GiLoCatur datang bersama kedua-dua anak lelaki - "abang" Fikri dan "adik" Fahim. Kami tiba di McD lebih kurang pada jam 9.30 malam. GiLoCatur sekeluarga keluar berjalan-jalan ke Sunway Pyramid petang tadi at about 4.00 o'clock. Setelah having dinner di Restoran SHAZ di TTDI Jaya, GiLoCatur dan keluarga tiba di rumah pada kira-kira jam 8.30 malam. Setelah mandi dan solat, GiLoCatur keluar untuk menuju ke McD di Seksyen 3, tempat biasa chess sparring. Pada kali ini, si anak bongsu GiLoCatur turut serta. Kami keluar rumah at about 9.05 pm. Lebih kurang selama setengah jam kami menunggu rakan-rakan sparring yang lain. Pada sesi sparring pada kali ini, beberapa muka baru telah muncul. Seorang pemain yang dikenali sebagai Zaid dan seorang lagi yang GiLoCatur belum sempat kenal telah menyertai sesi sparring. Maxtal dan Fikri telah berjaya ditewaskan oleh Zaid pada pusingan pertama dan kedua. Diharap lebih ramai muka-muka baru akan muncul di masa hadapan bagi memeriahkan lagi sesi sparring di McD. Di harap sesi sparring sebegini akan dapat mempromosi catur di kalangan masyarakat Shah Alam khususnya dan Selangor umumnya. "Wak Fauzi dan geng Subang Utarid juga sudah kerap bersparring di McD selain di tempat mereka. Tungguuuuuuuuuuuu ... mereka bakal menyerlah di Kejohanan Catur Amatur Stonemaster 21 Mac nanti!" GiLoCatur berentap sebanyak tiga kali (game) dengan Wak Fauzi malam ini sebelum mini-tournament. Keputusannya, 2 -1 yang berpihak kepada beliau. "Relax aje Abg Bro main chess sambil minum. Ni bukan pasal lawannya adalah seorang wanita. Tapi dah memang Abg Bro seorang pemain catur pro yang cool di negara ini. Semangat dan kegilaannya bermain catur memang sangat tinggi. Sebelum bersparring di McD ini, beliau bertanding di Kompleks PKNS dalam Insofar FIDE-rated Tournament. Selepas tamat mini-tournament, Abg Bro sambung sparring lagi. Catur sudah menjadi satu budaya hidup Abg Bro. Mampukah pemain-pemain catur muda Malaysia mencontohi Abg Bro?" "Tidak sangka boleh bukak 7 papan malam ini yakni seramai 14 pemain." Terima kasih kepada Maxtal di atas set clock dan chess set beliau di samping yang lain. The final ranking of the fourteen players participated in the mini tournament. Tahniah dan terima kasih kepada semua yang menjayakan sesi sparring dan mini-tournament ini. Semoga "chess" akan lebih bertapak dan "alive" di Shah Alam seperti suatu ketika dahulu. Both boards 4 and 5 drew. White players on boards #1, #3, and #7 won their respective games. Black players on boards #8 won. This weekend will be a bit longer than the usual one because on Friday, 26th February will be a public holiday. It is the Birthday of Prophet Muhammad S.A.W. There are so many chess tournaments during the weekend. Malaysian chess players are very lucky to have so many chess tournaments to participate. Let's take a look. Seremban Parade which is located opposite of the Seremban "Komuter" station. Below are the chess events / tournaments for this year organized by CAS, the acronym for Chess Association of Selangor. SO, CHESS PLAYERS ESPECIALLY "ANAK SELANGOR YANG CEMERLANG, GEMILANG & TERBILANG" COME TO PARTICIPATE IN THE ABOVE EVENTS ORGANIZED BY CAS. "SELANGOR, negeri yang maju & makmur! Proud to be anak Selangor!" 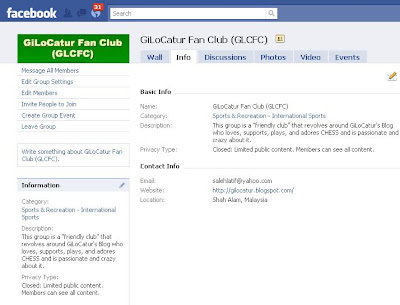 Today GiLoCatur had created a facebook group named GiLoCatur Fan Club or in short GLCFC. 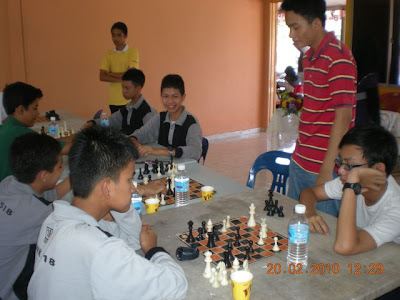 The objective of the facebook group is to promote chess mainly in Malaysia and the world in general. 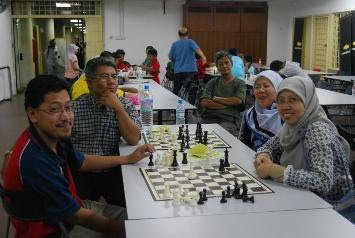 It will be one of the methods or approaches used by GiLoCatur for the "outreach program" to highlight the chess activities and events by the grass roots of the Malaysian society and community. GiLoCatur has chosen chess as the "core" or main social obligations for payback contribution to the society. Why facebook? Facebook has shown and proved its effective communication, popularity and interaction especially in Malaysia. There are millions of Malaysians - of all ages and walks of lives, who have facebook accounts and connecting between each other. What is the exact number? Because GiLoCatur would not be happy if get the right fact or figure. Just check yourself below "statistics" pictures. Malaysia is one the fastest growing countries on facebook. GiLoCatur hopes the Malaysians use the facebook for the good cause; NOT for the bad cause or wasting time. GiLoCatur always believes and a strong supporter in the usage of ICT and internet. Check here and here for good examples of ICT usage among the Malaysian "netizens". So, all chess lovers, players, parents, promoters and enthusiasts especially the Malaysians are welcome to join the group. Please email GiLoCatur at sabdlati@gmail.com. A spare time while waiting for something like a flight to KL from Kuching is very precious to a blogger like GiLoCatur. GiLoCatur's MH 2597 flight is delayed for 40 minutes to 8.40pm. So, GiLoCatur landed at The Coffee Bean that has free WiFi. Actually, it is not free because you will buy something like GiLoCatur ended up buy a tuna sandwich and a glass of hot chocolate. You will feel guilty if you sit down at the outlet without buying anything, right. By the way, what GiLoCatur is doing in Kuching? Actually, GiLoCatur had a job to do at one of company's customers offices. GiLoCatur arrived at Kuching on Sunday's night about the same time the Malaysian prime minister arrived in Kuching. GiLoCatur stayed at the Harbour View Hotel that is located on Jalan Temple. GiLoCatur only had one night to wondering around looking for a chess hangout or "port" in Kuching but to no avail. Never mind with that because if GiLoCatur found one, surely could not play well because being tired. So, GiLoCatur just busy with work except one entry about "Catur Rakyat - Part 1" written and posted from the hotel. If chess is already in your blood and life, anything chess-related will catch your eyes. Actually, GiLoCatur noticed a chess set in one of the officers' room. GiLoCatur agak sibuk pada hujung minggu lepas dengan pelbagai aktiviti terutamanya hari Sabtu, 20 Februari 2010. Pada pagi itu, GiLoCatur menghadiri mesyuarat PIBG SMK Seksyen 18 iaitu sekolah anak sulung GiLoCatur, Fikri. GiLoCatur tiba di dewan tempat mesyuarat beberapa minit sebelum mesyuarat bermula. Ini bermakna GiLoCatur terlepas sesi ucapan. Kira-kira pada pukul 11.30 pagi, GiLoCatur keluar dari dewan mesyuarat. Ingin tahu ke mana GiLoCatur pergi? GiLoCatur pergi ke Tabika Kemas Seksyen 18 Utara yang terletak kira-kira 10 minit berjalan kaki dari dewan di mana mesyuarat PIBG tersebut berlansung. Apa tujuan GiLoCatur ke situ? Dari gambar-gambar di bawah, sudah jelas ada satu pertandingan catur sedang diadakan. Sebenarnya Kelab Puteri UMNO cawangan Seksyen 18 Utara yang diketuai oleh sdri Fezawani Bt Amir Rijel (gambar di bawah) telah menganjurkan satu kejohanan catur. Mereka telah mengundang pelajar-pelajar SMK Seksyen 18 dan Seksyen 19 yang terletak berhampiran menyertai pertandingan tersebut. Memandangkan ini adalah pertandingan catur yang julung-julung kali dianjurkan oleh mereka, masih banyak kekurangan seperti tidak menggunakan jam dan set chess yang standard untuk pertandingan catur. GiLoCatur amat menyokong aktiviti sebegini dan ini merupakan satu permulaan yang bagus untuk kejohanan-kejohanan catur yang lebih besar dan terancang di masa hadapan. Bagi GiLoCatur, usaha murni yang dilakukan oleh Puteri UMNO tersebut amat bersesuaian dalam usaha melahirkan generasi muda yang mempunyai fikiran dan minda intelek sebagai pelapis pemimpin generasi akan datang. Aktiviti pertama mereka tersebut akan menjadi satu titik permulaan dalam menganjurkan kejohanan catur dan aktiviti-aktiviti berfaedah yang lain di masa hadapan. TAHNIAH dan SYABAS dari GiLoCatur! Pemuda UMNO Seksyen 18 Utara yang diketuai sdra Syed Azizul Syed Ismi (baju putih) membantu agar aktiviti berjalan lancar. Puteri UMNO Seksyen 18 Utara bersama pemenang-pemenang (Top 3). Hanya 3 hadiah berbentuk trofi yang disediakan. 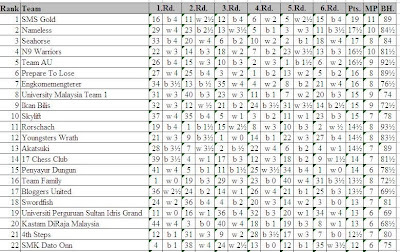 Format pertandingan ialah 5 pusingan rapid mengikut Sistem Swiss. Juara yang memenangi ke semua 5 pusingan adalah dari SMK Seksyen 18. Sementara naib juara dan pemenang ketiga adalah pelajar dari SMK Seksyen 19. Pemenang-pemenang bersama guru pengiring mereka yang merupakan Guru Penasihat Kelab Catur sekolah masing-masing. Seramai 16 pelajar dari setiap sekolah memeriahkan pertandingan catur "rakyat" tersebut. Ini bermakna, sejumlah 32 peserta bertanding merebut tiga hadiah berbentuk trofi yang disediakan oleh pihak penganjur. Ke semua peserta bersama guru-guru pengiring mereka dan pihak penganjur bergambar kenang-kenangan di akhir majlis selepas penyampaian hadiah dan sijil. Siapa "si cilik" yang berdiri di sebelah GiLoCatur tu? Anak GiLoCatur ke? Eh, bukan ... memang "si cilik" tersebut juga berumur 8 tahun seperti Fahim, anak bongsu GiLoCatur. Nama "si cilik" yang bergambar dengan GiLoCatur di atas ialah adik Jagathees A/L Guna Balan yang sekarang tinggal di Johor Baharu. Menurut bapanya, Jagathees sangat minat bermain catur dan juga laman blog GiLoCatur. GiLoCatur amat terharu dan sangat berbesar hati (tidak lupa juga ucapan berbanyak terima kasih) jika laman blog ini menjadi tatapan beliau setiap hari untuk mendapatkan info dan berita-berita tentang catur terutamanya pertandingan catur tempatan. Menurut Encik Guna Balan lagi, dek kerana minat anaknya yang mendalam terhadap catur, mereka sanggup berkorban masa dan wang menyertai pertandingan-pertandingan catur di Kuala Lumpur, Ipoh dan Shah Alam hampir setiap minggu. Bulan Mac nanti, mereka juga akan turun ke Pulau Pinang untuk menyertai National Age Group (NAG). GiLoCatur juga "salute" kepada Encik Guna yang memberi sokongan padu kepada anaknya dalam sukan (yang tidak popular dan bukan sukan teras seperti bola sepak) catur. Diharap pihak-pihak yang bertanggungjawab dan berkenaan memberi perhatian kepada pengorbanan ibubapa seperti ini dalam melahirkan jaguh-jaguh sukan negara. GiLoCatur ingin memberi galakan kepada adik Jagathees agar terus berkerja keras dan kuat berlatih catur agar menjadi salah seorang Grandmaster (GM) suatu hari nanti. Sudah pasti gambar di atas yang dirakam ketika pertandingan catur Uptown Shah Alam baru-baru ini akan menjadi satu kenangan terindah buat GiLoCatur. [ This entry is written from Kuching, Sarawak. GiLoCatur just arrived in Kuching a couple of hours ago (10.35 pm to be exact landed at the airport) due to work. GiLoCatur will be in Kuching until Tuesday night. 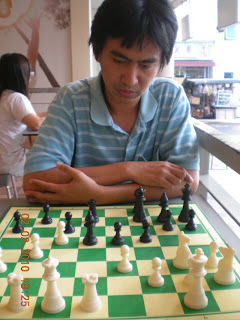 If there is a chess hangout or "port" in Kuching area where chess players sparring, GiLoCatur would like to visit. Please call GiLoCatur at 019.606.1948 and tell about the venue. 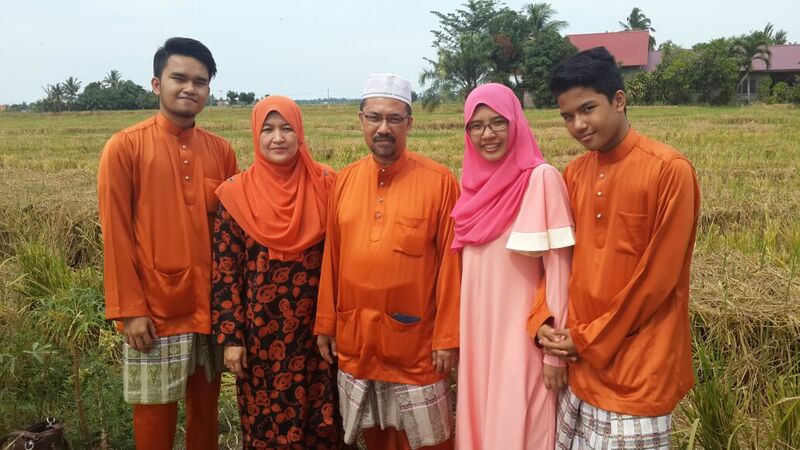 GiLoCatur and family (except Fikri) just arrived home less than one hour ago from Uptown Shah Alam. GiLoCatur and both the only daughter and the youngest son participated in the six round 15-minute (G/15) chess tournament organized by Uptown Shah Alam. Fifty six players mostly from Shah Alam and nearby areas enrolled in the tournament held at night. 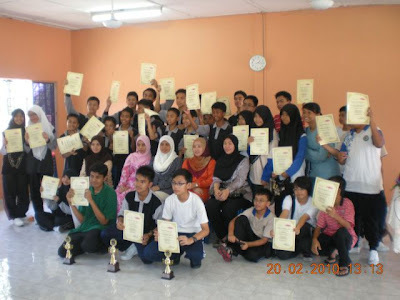 But some of them came from quite far like Ipoh, Melaka and Johor Baharu for the love and passion of chess. GiLoCatur is quite happy with own performance. GiLoCatur just wants to have fun and enjoy playing chess in the tournament. GiLoCatur won against 1498-rated opponent in the third round and drew with 1580-rated opponent in the fourth round. Kenapa GiLoCatur paparkan gambar-gambar di atas? Mungkin semua pembaca blog ini tertanya-tanya. Berikut adalah kaitannya. JAFFOLEA AKAN MENGANJURKAN SATU KEJOHANAN CATUR MELAYU TERTUTUP DI NEGARA INI PADA BULAN JUN 2010. Jadi apakah kaitan gambar-gambar di atas dengan kejohanan yang akan dianjurkan? 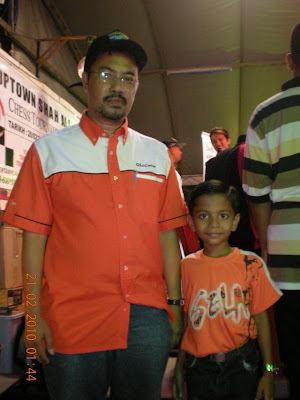 Mereka adalah beberapa pemain catur yang berpotensi untuk menjadi juara kejohanan catur tertutup Melayu 2010. Justeru itu, kepada semua pemain-pemain catur Melayu di negara ini, bersiap siagalah dengan segala persiapan terbaik seperti ulangkaji pembukaan, latih tubi bermain catur, dan menuntut ilmu dan pengetahun baru seperti berguru dengan GM. Maklumat terperinci akan menyusul kemudian. Kerap-keraplah menjenguk laman blog ini dari masa ke semasa. Menurut satu sumber, agak lumayan hadiah-hadiah yang bakal disediakan oleh pihak penganjur. GiLoCatur memang yakin jika ianya ditaja oleh Tuan Haji Yahaya Ahmad, salah seorang penganjur dan penaja kejohanan catur yang aktif dan dermawan ketika ini. GiLoCatur mendoakan agar Allah akan mengurniakan rezeki yang lebih banyak kepada beliau. Nota : Semua gambar adalah dari koleksi og8180fotopages (NWM Roslina Marmono). Malaysia needs to make the preparation for the next year annual chess challenge against its neighbouring country, Singapore starting from now. Proper and well-prepared planning in all aspects of the challenge especially identifying and preparing the players need to start as soon as possible to ensure that Malaysia will win the next battle. The players must be instilled with motivation and winning spirit and mentality. Post mortem to identify the weakness or which area to be improved need to be done and studied thoroughly. Even though, the chess challenge is just a friendly match, but it must be taken seriously since it involves a reputation and pride. GiLoCatur, as a Malaysian, feels frustrated with the defeat especially the news is published in the FIDE website ( here ) and picked up by the famous Susan Polgar's chess blog ( here ) and surely in the SCF's website ( here ). GiLoCatur's still remember how happy and proud GiLoCatur was when Malaysia or Selangor won the football match against Singapore in the yesteryears. With other Selangor and Malaysian supporters, GiLoCatur would sing and celebrate the win. GiLoCatur hopes that such situation to be felt and emulated by all the Malaysian chess players and community. The young Malaysian chess players should follow the example showed by their seniors like IM Jimmy Liew and IM Yee Weng in contributing their efforts, skills, experience and pride in donning the Malaysian colours. It is a very commendable effort when Malaysian players are offered an incentive for winning their games. Even the Singapore contingent uses the same approach in motivating their players. GiLoCatur believes not many Malaysians know where LUBBOCK is. 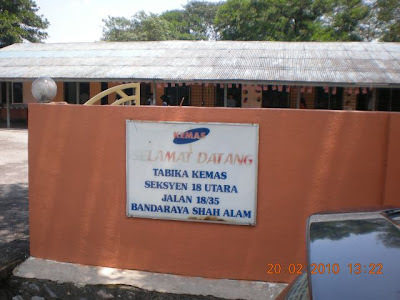 Those who know about this place are the Malaysians who were students of its university or their relatives or friends. GiLoCatur was very fortunate to set foot on Lubbock while being a student in El Paso, both are towns in Texas USA. GiLoCatur went to Lubbock, in 1991, to attend a wedding reception of a Malaysian friend who was studying there (at Texas Tech University). Why suddenly GiLoCatur wants to talk about Lubbock? 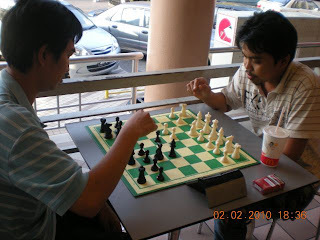 Actually, it is because GiLoCatur sees the similarity of a chess club in Lubbock that has a chess practising or studying session in a restaurant or "warungs" or "kedai kopis" and the chess sparring that GiLoCatur and 17ChessClub members participate here in Shah Alam, be it at McDonalds or Jayati Restaurant. For Malaysian chess community information, the Lubbock Chess Club has its weekly learning, practising and playing session at Lin's Buffet or Sugar Brown's Coffee. Check out about this and see their pictures at this website. In order to improve and have quality chess players at the grass root level, such activity need to be alive and kicking in this country. 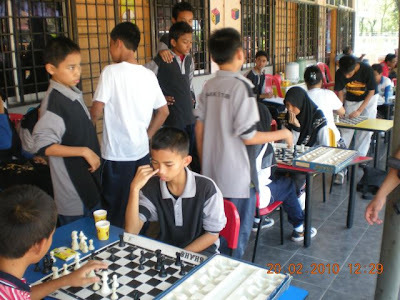 More and more chess clubs in Malaysia are required and necessary and they need to be active. For sure, Malaysia would be having not only its first GM, but many many titled chess players when many many chess clubs are active. So, in short, let's join us at McDonalds or maybe other places for chess sparring. Create, establish and activate more and more chess clubs. Do You Know Who Is "Mr First Saturday"? Yes that is the tagline for this entry. So, can you answer the above question? What ?? Jax Tham ?? mmmm maybe in the Malaysian context. But GiLoCatur prefers to call him "Mr First Friday", how about that? GiLoCatur hopes that the title has not been given to anyone else. Actually, GiLoCatur just found out today about "Mr First Saturday" and his "First Saturday" chess tournament. 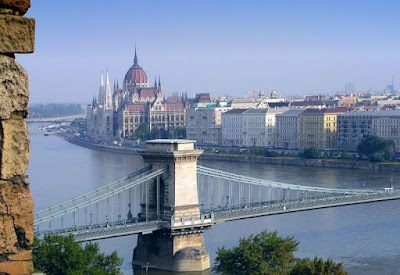 The tournament is actually a world-class monthly chess tournament being held in Budapest, Hungary. It has been run for about 17 years since 1992. Many top and well-known chess grandmasters had earned a GM norm from such tournament. The man who runs the tournament is Laszlo Nagy. He needs about one year to break even. Click here and his official website here for more about him and his chess tournament. GiLoCatur hopes that Jax Tham will keep continue his monthly chess tournament and his tournament will attract titled players in the future like The First Saturday in Budapest. How do GiLoCatur found out about The First Saturday in Budapest? Actually, it is from one of the entries in Susan Polgar's famous chess blog as per this link. Based on her blog, GM Niaz Murshed of Bangladesh, plans to organize titled or norm chess tournaments in Bangladesh to promote chess in the region and to provide more, better and cheaper opportunity for Asian chess players to get titled norms. If Bangladesh can do it, GiLoCatur is strongly confident that we in Malaysia can organize the same. Moreover, Malaysia has abundant exotic and outstanding places as the tournament venue. So, any takers? This year edition of Malaysia vs Singapore Chess Challenge just ends. The final result is Malaysia lost to Singapore just by mere a point, 75.5 - 76.5. The format is two rounds of chess classics, 90 minute + 30 seconds, and two rounds of chess rapids. The total number of players is 38 which includes various categories like veteran, men, women and age groups. In the first round of chess classics where Malaysian players played white, Malaysia triumphed against its neighbouring country by 6 points, 22 - 16. But Singapore improved in the second round when both countries were tied at 19 points each. Singapore players geared up and closed the gap after edging Malaysia by 3 and 1/2 points in the first round of rapid games. The scores is 20.5 to 17.5. In the final round i.e. round 2 of the rapid event, Singapore won 4 points more to surpass by one mere point and win the chess challenge. The score? 21 for Singapore and 17 for Malaysia. For GiLoCatur, it is still a good result for Malaysia. If compares to the results of the previous years like in the year of 2007, this year's result is still much better. Let's look at the results of such challenge in 2007 as per below summary. Malaysia lost 53 to 87. The format in that year was just two rounds, not sure though either classics or rapids. The number of players was 70 - 38 in men/boys category and 32 in women/girls category. 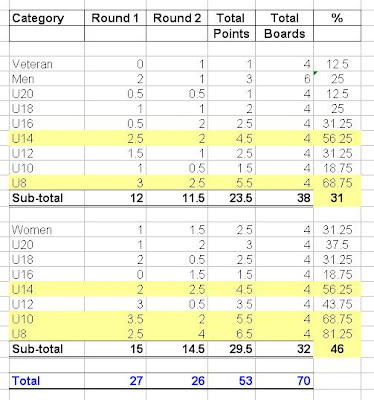 Malaysia had the lowest winning percentage in veteran and U20 Boys categories with just 12.5%. The highest winning percentage for both sexes is Under 8. Under 14 Boys was the second highest for men/boys while for women/girls were Under 10 followed by Under 14. From the above statistics, what GiLoCatur can say that Malaysia has potential in the younger age groups. It means, parents are successful in developing their young ones in chess. But when their children are getting older, their chess potential is either stagnant or declined. Malaysian chess community should look into this scenario and situation. Factors, root causes or reasons for such scenario need to identified and rectified. In short, GiLoCatur believes chess is improving at this moment in Malaysia. More and more chess tournaments are organized. Not just tournaments; BUT quality ones. The quality of chess players is improving a lot. Chess awareness and interest is growing. The number of local chess blogs has been mushrooming. Chess sparring and practice are many and more often. So, keep it up Malaysian chess community! GiLoCatur strongly believes Singapore is aware of this and it will keep tab about such scenario to ensure SINGAPORE KEEPS WINNING AGAINST MALAYSIA IN THE CHESS CHALLENGE! GiLoCatur does not agree when some people say that Singapore is sending a weak contingent this year. That is not Singapore! So, GiLoCatur would like to congratulate all the Malaysian contingent where some of them take this challenge very seriously by having a chess training and practice. "SYABAS & TAHNIAH!" GiLoCatur wants to share below world chess tournaments. Maybe it is quite late for planning and arranging to participate in such tournaments held in USA for the Malaysians. But, hey who knows ..
or also can check here. 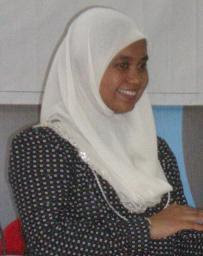 Due to work, GiLoCatur went to outstation to Muar twice this year - the first one in the third week of January and the second one in early February. Muar, located about 200 kilometers south from Shah Alam is one of Johor's cities. Johor is one of the 14 Malaysian states that is situated in the south of peninsular Malaysia next to Singapore. Muar, opened in 1884, is quite an old city and has its own history. It is also known as "Bandar Maharani". GiLoCatur likes to visit Muar because it has many beautiful and historical places and buildings and delicious food. 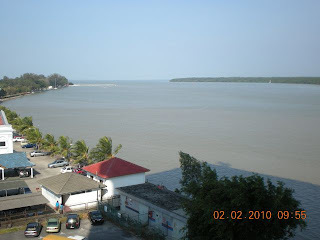 Beautiful Muar River viewed from Muar Traders Hotel, the hotel where GiLoCatur stayed during the second outstation in Muar. The room that GiLoCatur was given was at the toppest level, the 12th. Check out more details of the hotel here. GiLoCatur recommends whomever come to Muar to stay at the hotel. 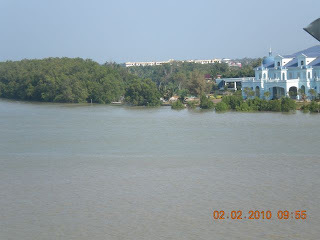 The above Muar river pictures were taken while GiLoCatur having breakfast on Tuesday morning, 2nd Feb 2010. 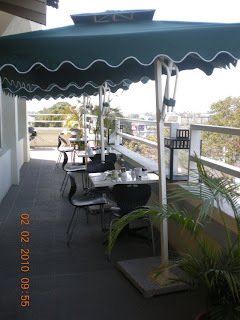 The terrace where GiLoCatur sit down having the breakfast. What a wonderful river view. GiLoCatur wished that his wife could join in that beautiful morning. Another wish is having a chess game during that time. 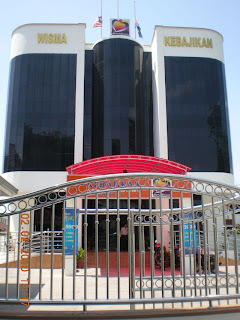 The above building of "Wisma Kebajikan" caught GiLoCatur's attention. It is a beautiful design, don't you think? What building is this? The green color is rare to GiLoCatur. 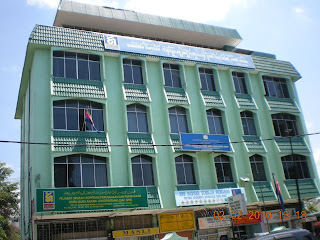 It is in the building where the office of Zullghafari, GiLoCatur's sparring partner while in Muar, is located. The above two adjacent buildings are more than 80 years of age. It is obvious that the buildings were built in 1928, two years earlier than the birth of GiLoCatur's mother. Yep, GiLoCatur's mother is going to be 80 years old this year. 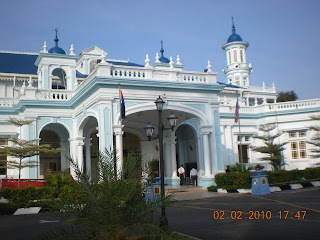 The first Jamek mosque, "Masjid Sultan Ibrahim" built in 1890, which is situated along the Muar river. If you notice in the first picture in this entry, you would notice a blue mosque similar to the above. It is not the same mosque though. In fact, it is the largest and newer mosque in Muar. 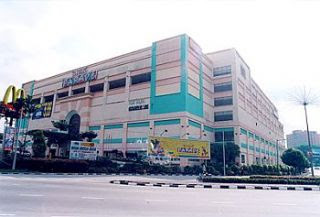 It is "Masjid Sultan Ismail", which was built in 2002. It is also known as the second Jamek mosque. 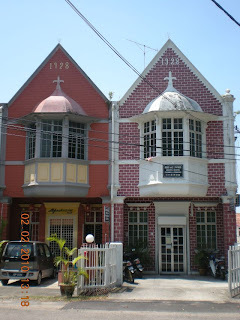 In our "Bahasa Melayu", the above small building is called "wakaf". 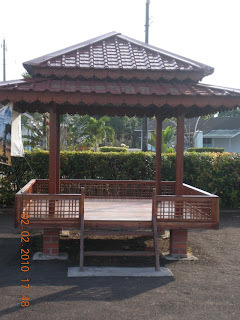 The above "wakaf" is located in the compound of Sultan Ibrahim mosque. Visitors can sit down and relax in it. For GiLoCatur, it is a very nice place for a chess game. Don't you agree? Zullghafari was so focus while we were having chess sparring at McDonalds. During this outstation, we had two sparring sessions - the first, at the lobby of Muar Traders Hotel at night between 10.00pm until midnite and the second, at McDonalds between 6.00 to 7.00pm on the following day. 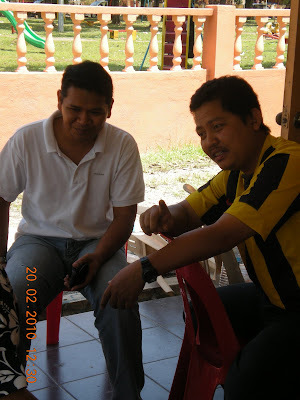 Zullghafari (left) who stays and works in Muar was having a chess match with GiLoCatur's office mate, Faiz. GiLoCatur didn't know that Faiz could play chess. He participated in our company's Mini Sports Carnival chess event several weeks ago. (GiLoCatur has yet the opportunity to write about it in this blog.) 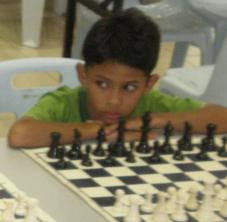 According to Faiz, he last played chess while representing his school in MSS chess tournament in Malacca while he was in form 4. 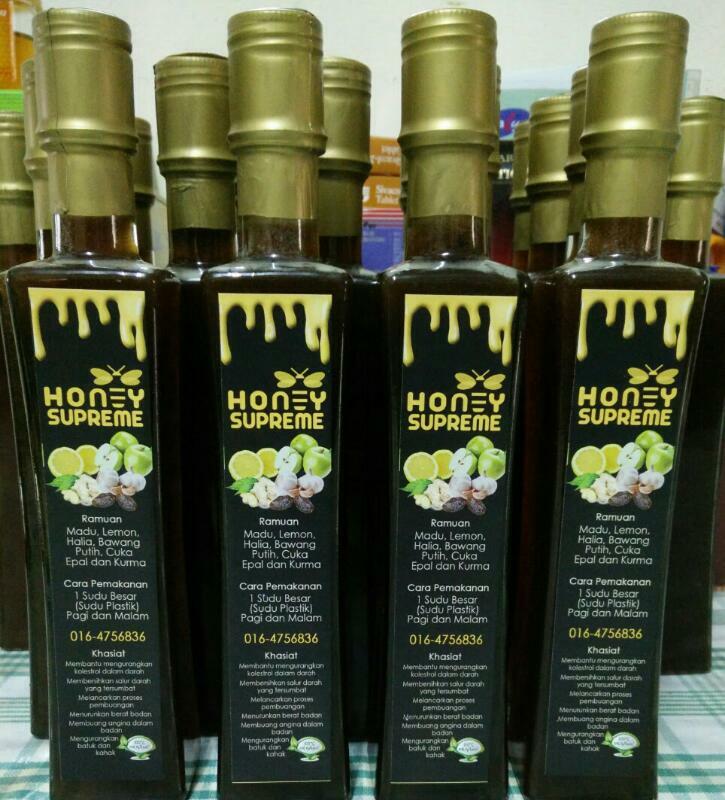 Click below links for more details about MUAR. We Need OKU-friendly Chess Tournaments!